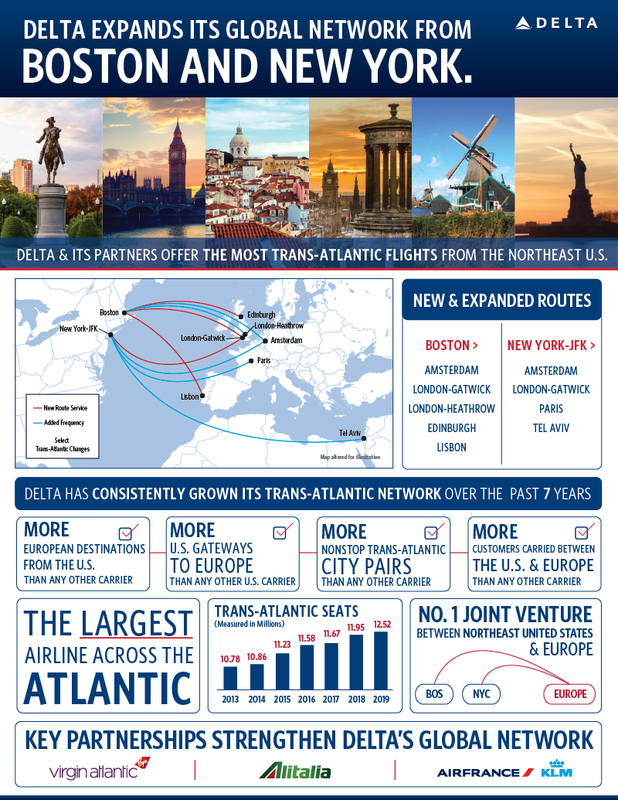 Delta is building on its position as the leading global carrier in Boston and New York with the launch of two new international routes – nonstop service from Boston’s Logan International Airport and New York’s John F. Kennedy International Airport to London’s Gatwick Airport will begin next summer in partnership with Virgin Atlantic. Delta is also enhancing its aircraft on all flights between London-Heathrow and both Boston and JFK. Beginning this week, Delta flights between Boston and London-Heathrow will operate on an Airbus A330-200, which already serves Delta’s JFK-Heathrow flights and features additional premium seats. And in November 2019, the airline will introduce on these routes fully refurbished Boeing 767-400s, featuring a modern interior and all four branded seat products – including a more private Delta One experience, Delta Premium Select, Delta Comfort+ and Main Cabin – to give customers greater choice when they travel. Delta’s refreshed 764-400 aircraft will also feature the new wireless IFE system developed by Delta Flight Productswith seat-back entertainment screens in every cabin and thoughtful touches like full-spectrum LED ambient lighting and memory foam cushions throughout the aircraft for added comfort.